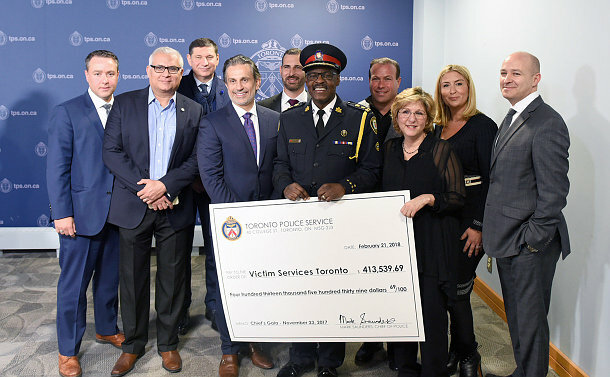 Last year’s Chief’s Gala in support of Victim Services Toronto (VST) raised a record $413,539.69. The cheque presentation took place on February 21 at Toronto Police headquarters. It was the first official event that Chief Mark Saunders attended after undergoing a kidney transplant. The money raised from the Chief’s Gala will be used to support and enhance VST core programs. They include high-risk support services and the 24/7 crisis response, case management, T.E.A.R (teens ending abusive relationships), trauma dog and the vibrant volunteer programs. Saunders and Levine thanked the sponsors and volunteers for their unwavering support. VST provides crisis response, trauma and support services to victims of crime and sudden tragic circumstances 24 hours a day. Supervised by crisis counsellors, volunteers provide crisis intervention and referrals, assist on the telephone, or attend the scene as requested. They also help with fundraising and other community outreach initiatives.